I absolutely LOVE this table lamp. I was looking for a different shape than your traditional table lamp. The color, the beading, the height is a perfect blend for our decor. 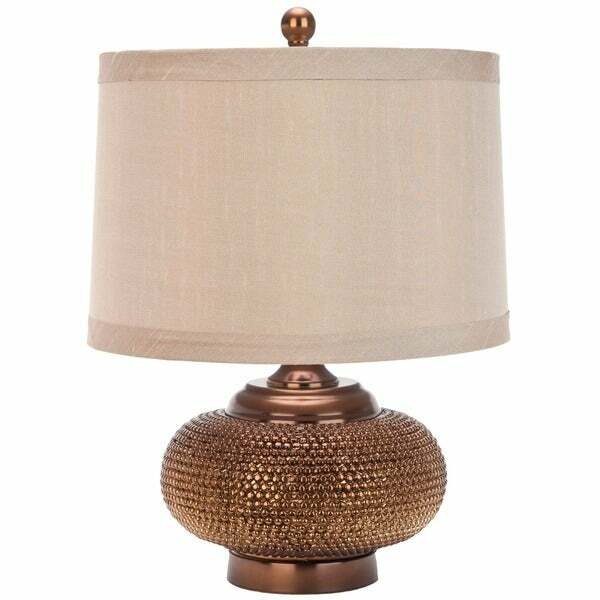 Catalina Lighting Maui Red Crackle Glass Table Lamp - 14" x 14" x 20.5"
The shapely Alexis Gold Bead Lamp conjures images of a vintage Moroccan vessel crafted of hammered metal. The compressed round body is made from gold plated poly resin that creates the effect of golden beads. A taupe Geneva hard back shade updates the look for 21st century homes. Really pretty with the gold beading. I purchased two of this lamp because I needed lamps on my bedside tables and didn't want anything too tall or high. They're absolutely perfect. The tan/taupe shades and the gold base match my colors in that room, just as I had hoped. Really happy with this purchase. Love this little accent lamp, which I placed on a table between two large leather chairs in my family room. It is perfect for that little bit of lighting while watching movies, and is a beautiful added piece of gold decor for the room. It’s unusual design and shale has drawn many compliments. I dare not tell how little I paid for this little gem! Very nice quality. Set on a hall table. The metal beading adds a nice texture. Pretty, nice size, the color of the shade is a light tan color and not a cream color as shown, but they are well made and look good with our new bedding and our newly remodeled master bathroom, especially like that they came with lightbulbs and were well packed. They are a brown/bronze color, overall, very pleased! This lamp is unbelievably stunning. Everything about it is perfect - it looks amazing on a small side table in the living room. The shade I was not too sure about until I received it - I was wrong, it was a great compliment to the lamp. Love the way it sort of shimmers when lit. Think I may have to buy 2 more for the master. Buy it, you won't be disappointed. Really like these lamps. The base is not metal, and will break if dropped. And the finish on it has a bit of "bling". They are a great height if you want something lower but substantial for lighting. Absolutely beautiful. I got theses to replace 2 old brass lamps. They Look great in my living room side tables. I’m so glad I got 2. Nice to sit by the fireplace and read with this lamp. Good lighting too. I love it. It was the look I was looking for. It's okay. It is a lot smaller than I thought it would be. When I thought 19", I didn't think that included the 2" finial. Also, the shade is darker than the picture online. I'd probably return it if that wasn't such a hassle. Beautiful addition to our living room decor. Love this lamp! Thanks overstock! Love this lamp. I wish it was a little taller. I've received many compliments on this lamp. Love the base. The shade is dark gray not as light as it appears on line. Nice little lamp. Nice lamp with a nice bronze color. The lamp shade is really nice and has a nice sheen to it. It also comes with a light bulb which was a nice surprise. 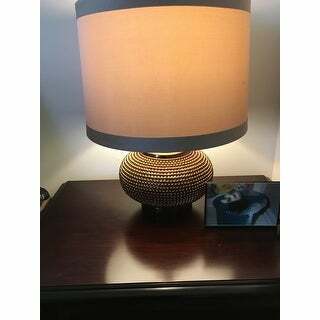 "Is this lamp base gold as it appears to be bronze in the photo?????" The gold appears to have a bronze tint. I really Ike the lamp"s design and is hopeful that it fit in my livingroom. "What color is the shade of the lamp? 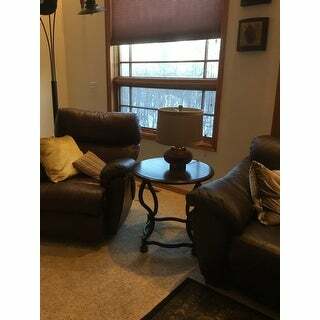 Photo looks very black but description says it's taupe." The current photos for this lamp are incorrect and are looking to be changed. The lamp does not look like the ring lamp on site. We apologize for the confusion we might have caused.